Our partner 1E recently released their Enterprise Windows 10 Migration report. The research was based on an online survey completed by more than 500 U.S IT decision makers and provides unique insight into the Windows 10 migration methods currently being employed by today’s enterprises. The report can be downloaded right here. The study found that many organisations are missing the opportunity to enable advanced Windows 10 security features during their migration project. Of course the irony around this is that security remains the single biggest driver in migrating to Windows 10 in the first place with 47% of respondents identifying security as the main anticipated benefit. Indeed, the survey confirmed that such security concerns are well warranted, with nearly two in three respondents claiming their organization has experienced a security breach. 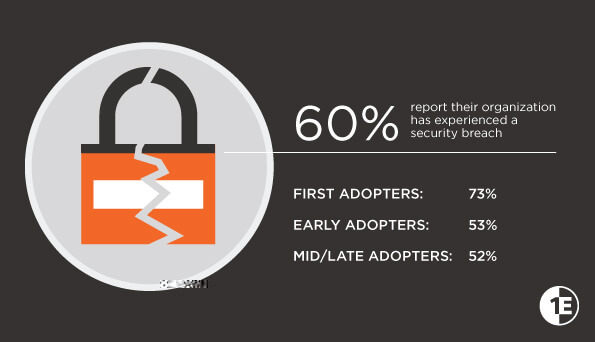 To elaborate on this, the study showed that first adopters (73%) and early adopters (53%) were more likely to have experienced a security breach that mid/late adopters (52%). “Companies clearly want a more secure operating system by adopting Windows 10, but in the rush to get there, organizations can end up being inadequately protected and would benefit from a more methodical approach”, explains Sumir Karayi, founder and CEO of 1E. An additional irony is that, whatever the upgrade approach, nearly all (94%) respondents reported their company’s migration strategy still involves some level of manual labor. This manual intervention delays software roll out, leaves systems vulnerable to attack, and prevents scaling OS deployment to hundreds or thousands of systems in parallel. Thankfully, there’s no need to shoot the messenger. If you’re looking for a fully secure, fully automated Windows 10 migration, we can help with 1E’s enterprise tested toolset. Meanwhile, if you need to need to educate yourself on how migration can put you at risk in the first place, you can start today by downloading the report.